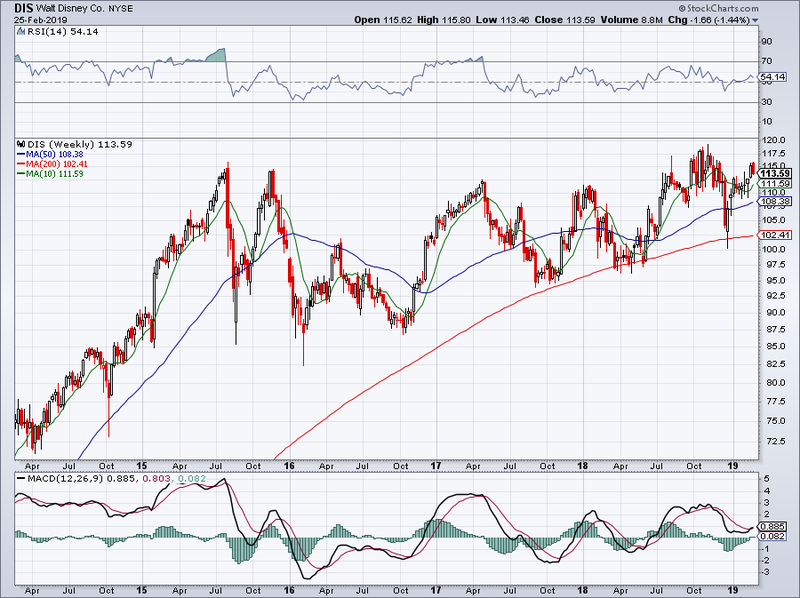 Shares of Walt Disney (NYSE:DIS) have been volatile lately, which has given investors an opportunity. Disney stock had been rallying over the past few trading sessions as it bounced off the 200-day moving average, but Disney stock was under pressure the day after the Oscars, falling about 1.5%. Source: Richard Stephenson via Flickr (Modified) It’s left some investors scratching their heads, even though it’s clear that other studios — like Comcast (NASDAQ:CMCSA) and Netflix (NASDAQ:NFLX) — did nab a lot of awards and attention at the show. But we don’t buy stocks based on how they’ll do during a few award ceremonies. We buy them based on their future earnings potential. When it comes to Disney, there’s plenty of potential. Let’s look at a few reasons to buy Disney stock. What a year it’s going to be for Disney when it comes to film releases. And while the analysts may short-change some of these films, remember that these are the guys that didn’t see Black Panther being that impactful when it ultimately went on to become one of the most successful movies of all time. Here’s what we’re looking at 2019: Captain Marvel and live-action Dumbo in March, Penguins and Avengers: Endgame in April, and live-action Aladdin in May. Toy Story 4 hits in June, The Lion King in July and Frozen 2 in November. And what better way to finish out the year than with Star Wars: Episode 9, right? Simply put, the studio is going to crush it this year and Disney’s top and bottom line are going to feel a boost as a result. The economy continues to chug along and the labor market is as tight as it’s been in quite some time. What does that mean? Well, for one it means big business for Disney. Family vacations to Disney parks, splurging to lodge in the magical hotels and paying up for extra perks should help drive higher margins and revenue for Disney. The fact that attendance remains strong despite higher park prices will only drive up profits for the entertainment king. But a strong economy translates to more than just park sales. It means more little kids dressing up as Avengers and Elsa from Frozen for Halloween. It means more toy sales — which also benefits Disney’s partner Hasbro (NASDAQ:HAS) — around the holidays and more outings to the theatre. No matter how you slice it, a strong economy is good for Disney. This last reason is somewhat of a wild card. We could have easily said that shares are holding over long-term downtrend resistance and as a result that warrants a buy of Disney stock. For the record, I don’t disagree with that premise, but instead wanted to focus on a different potential catalyst. The streaming wars are evident and cord-cutting is most definitely a secular trend. Only someone who lives under a rock would argue against that reality at this point. It’s dealt a tough blow to cable companies and AT&T (NYSE:T), while allowing companies like Roku (NASDAQ:ROKU) to post massive moves to the upside. In any regard, Disney has already launched ESPN+, a streaming platform for its ESPN content. However, the larger opportunity rests with Disney+, which will have the company’s movies (like Star Wars, Marvel, etc.) and it family-friendly content on it. For those that think people won’t pay for it, just realize how many times a kid wants to rewatch the same movie over and over again and Disney+ just became a parent’s best friend. With its acquisition of Twenty-First Century Fox, Disney will also control a majority of Hulu, yet another streaming option. Many of Netflix’s top-streamed movies have been Disney and soon it will start losing the latter’s content. Disney has a real opportunity with streaming and investors will want to see if that enthusiasm gets priced into the stock at some point this year, with Disney+ expected to launch later this year. Remember, as Alphabet’s (NASDAQ:GOOGL) YouTubeTV, Roku and other streaming platforms and skinny bundles gain momentum, Disney is a winner thanks to its best-in-class content. Bret Kenwell is the manager and author of Future Blue Chips and is on Twitter @BretKenwell. As of this writing, Bret Kenwell is long T, GOOGL and ROKU. The post 3 Reasons Disney Stock Is a Must-Own in 2019 appeared first on InvestorPlace.